The Upanishads do not concern themselves with mere theories. They raise direct questions regarding the source of thought, the essence of our being and are as relevant today as they were 2000 ago. Sri M was born in Trivandrum, Kerala. At the age of nineteen and a half, attracted by a strange and irresistible urge to go to the Himalayas, he left home. Back in the plains, he, as instructed by his Master, lived a normal life, working for a living, fulfilling his social commitments and at the same time preparing himself to teach all that he had learnt and experienced. At a signal from his Master he entered the teaching phase of his life. They Isavasya proclaims the all-pervasiveness of the totality of consciousness which is here called Isha, the Lord, and urges one to let go the narrow and self-centered identity we are caught up in and rejoice in the flow of the infinite wholeness of Life. The word Kena means who. 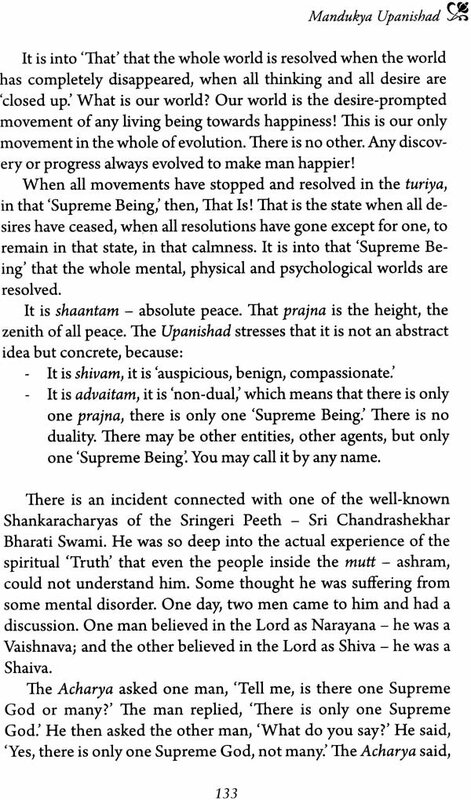 This Upanishad concerns itself with the question of ones ID. Is there is separate I or is it merely a tern used to describe the totality of cognizance. Is there an I beyond the limited, self-centered ID? The Mandukya examines the same idea but in a different way, exploring the states of consciousness all human beings experience namely, the waking state, the dream state and the deep sleep state, and postulated that there is a common experience in all these stated, a witness, not affected by the states, and which is the totality of consciousness called Turiya represented by the Pranava, OM. The contents of this book are the edited transcriptions of the discourses on the Upanishads by Sri M.
Minimum editing has been done to retain the style of the talks. The editor acknowledges the contribution of Ms. Uma Singh and Ms. Kamal Aswani in transcribing the discourses with care and attention. The introductory portions might sound repetitious at times, but that could not be avoided, considering that the talks were given at different times to different people. 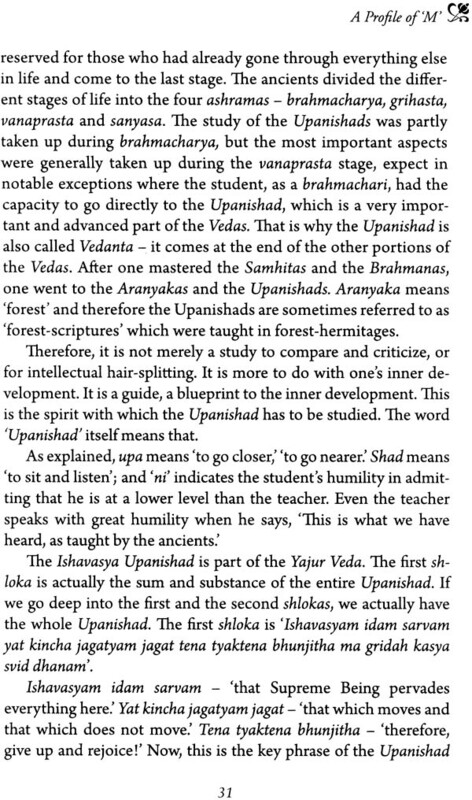 It is suggested that these portions be re-read for a thorough comprehension of each Upanishad. The universal truths articulated in the Upanishads have formed the basis for numerous commentaries down through the centuries, beginning with the luminous insights of Adi Shankaracharya. In our own times Sri Aurobindo, Sri Krishnaprem, Dr Radhakrishnan, Swami Ranganathananda, Eknath Ishwaran and other great seers and sages have produced commentaries and interpretations on various Upanishads. The Upanishads are enduring and unfailing sources of inspiration, and their impact grows with each successive reading. One of my favourites is the Mundaka which I have translated and upon which I have attempted a short commentary. 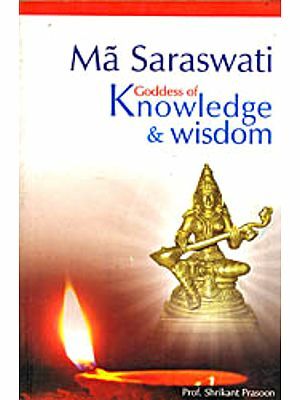 The author of this book, Sri Mumtaz Mi, popularly knows as ‘M’, has spoken extensively upon the Upanishads, based on his personal experience. The fact that a person born a Muslim should have such a deep insight into the Hindu tradition proves once again that the spiritual path accepts no boundaries. The three Upanishads upon which M has commented are among the most important — the Ishavasya, which is always given pride of place in any list of Upanishads, the Mandukya which expounds the deeper symbolism of the sacred symbol Aum, and the Kena where we have the marvellous allegory of the Devas who thought they had won a victory, whereas actually it was the victory of the divine Brahman. 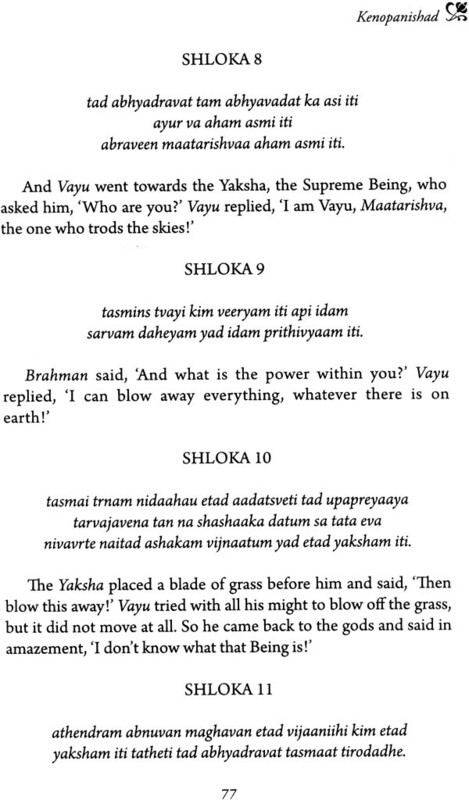 In this Upanishad we come across Shiva-and Yaksha, whose identity the Devas are unable to comprehend, and are also introduced to Uma, Haimavati, the many splendoured daughter of the Himalayas, who appears as the mediator between the Devas and the Supreme Brahman. In these talks M has expounded in a clear and cogent fashion various aspects of these three great texts. I have pleasure in commending this book to spiritual seekers and students of Hinduism around the world. The boy was a little more than 9 years old when he saw the strange being. He was the son of a Deccani Muslim family, settled in Trivandrum, the beautiful capital of Kerala. Having heard stories of angels coming down to bless Mohammed and other prophets and saints from his devout grandmother, he thought at first that it was an angel. One evening, the boy was wandering around the courtyard of his house in Vanchiyoor, doing nothing in particular. At the far end of the courtyard, he saw someone standing under the jackfruit tree. ‘The stranger gestured to the boy to come forward. The boy felt no fear whatsoever, and was eager to go closer to the stranger. ‘The stranger was tall, fair and well-built and was bare-bodied except for a piece of loin cloth worn around his waist. He put his right hand on the boy’s head and asked with kindness, “Do you remember anything?” in Hindi. To the boy’s answer that he didn’t, the stranger said in Deccani, “You will understand later. You will not meet me for many years after this, but you will have to finish the studies that you have left incomplete. You will not be allowed to tell anyone about me until the time is ripe. Go home now.” With that he vanished. That was the first initiation. Two years later, while playing hide and seek; the boy experienced what maybe described in yogic terms as Keval Kumbhak the suspension of inhalation and exhalation. Bliss filled his heart. The breathing resumed in a few minutes. Soon he could get into it at will with a deep sigh. The bliss that he experienced convinced him that a greater world existed within his being — a world of spiritual bliss. In his outward appearance he was just like any other boy except that he loved religious scriptures and philosophy — no matter of which religion, devotional songs and discussions on God, saints and sages. When he was eleven, he used to go in the evenings to a certain house which belonged to one Mr. Pillai, whose nephew and son-in-law tutored him in mathematics. One evening he entered Pillai’s house as usual and found himself face to face with a venerable, sturdy man of about sixty, clean shaven and with closely cropped silver grey hair, wearing a half sleeved shirt and loin cloth, sitting cross-legged on a bench. The room smelled of incense. Again the breathless condition and greater bliss. ‘M’ stood up and went straight home. The guidance had begun. He was the first of the great souls ‘M’ was to meet in the course of his spiritual journey. Much later ‘M’ came to know that the man was a great self-realized soul who lived in ‘Atma Bhava’ and was simply called Pujapura Swami since he lived in Pujapura. He was unmarried but not a formal monk. In his youth he had been initiated into yogic practices by a great teacher and ever since had lived a model life, his heart absorbed in the blissful, Supreme Brahman while he performed his duties likes an ordinary mortal. ‘M’ also learnt that the Swami used to hold midnight Satsangs on certain days, which a great sanyasin, who had renounced even his loin-cloth, would sometimes attend. Pujapura Swami was not known outside a small circle because he forbade propaganda. When ‘M’ was seventeen, the sanyas in was no more, but a friend handed over a compilation of his teachings to ‘M’ which was privately circulated. It contained the essence of Vedanta in very simple language. By then, the knowledge that ‘M’ needed from time to time as he progressed on the path began to come to him automatically. His lather had borrowed B. K. S. Iyengar’s Light on Yoga from a friend of his (his father was never an orthodox Muslim). ‘M’ read it through. A yoga teacher, Sri Sharma, gave him his initial lessons on yogasanas and Surya Namaskaras. ‘M’ met Swami Tapasyananda of the Ramakrishna Mission, a direct disciple of Sarada Devi. He was then the head of Ramakrishiia Mission at Trivandrum. The librarian at the Trivandrum Public I library kept ‘M’ well supplied with the works of Vivekananda. He chanced to read Swami Chinmayananda’s Japa Yoga and Gayatri and he began to chant the Gayatri Mantra. Atlantic instructed him in certain mantras and lent him SirJohnWoodroffe’s Serpent Power. He read many other books — the Upanishads, the Gita, Yogic texts and Vedanta included. He discovered that Sanskrit was not too difficult to understand. Side by side with gaining theoretical knowledge, he meditated for long hours, especially at midnight. He had merely to shut his eyes and concentrate on the lotus of the heart to enter into Keval Kumbhak and experience tremendous bliss and extraordinary visions of divine lights and voices. Sometimes terrifying visions would flit across his mind but they would pass and he would once again be filled with ecstasy. Then he met a great person known as Chempazanthi Swami. The Jesuits had started their first Loyola Junior College at Sreekaryam in Trivandrum and ‘M’ was among the first batch of pre degree students. A few kilometers away were the remote village of Chempazanthi which is the birth place of Sri Narayana Guru, the great reformer-saint. Close to Chempazanthi is Chenkotkonam where the Swami lived. He was a tea-shop owner turned saint. A great bhakta of Rama, he was known to have lived like Hanuman for a long time, eating nuts and climbing trees. He was fond ofbhajans and kirtans. When ‘M’ met him in his hut, he was thin and frail and very delicate looking. Crowning his ever-smiling face was a great chunk of wound-up matted hair and he smelled of Vibhuti. Taking a pinch of ash, he touched M’s forehead with it, popped a couple of grapes into his mouth and said, ‘Umm, needs to ripen, will ripen. Do bhajans.’‘M’ meditated for a few minutes, prostrated and left the place. Those days ‘M’ had a close Brahmin friend whose father worshipped Sai Baba of Shirdi. The moment ‘M’ saw Baba’s picture, an irresistible desire to know about Baba’s life rose in him. The next day Mr. Subramanya Iyer, an advocate, who was his friend’s landlord, gave him a copy of the Life of Sal Baba of Shirdi by Narasimha Swamiji.” Then he lent ‘M’ Sai Sat Charita. He fell in love with the great Faqir. At this time ‘M’ heard from a friend of his who was a medical student (he is now a neuro-surgeon) about a lady Avadhuta called Mai Ma, who lived on the Kanyakumari beach. She was reputed to be over a hundred years old and no one could say where she came from or what language she spoke. The few words she said sounded very much like Bengali. ‘M’ went to see her alone. Kanyakumari is close to Trivandrum. He reached Kanyakumari a little before noon. He walked from the bus stand and came to the entrance of the Devi Temple. He casually walked across the rocky beach and there she was. A woman who looked to be in her sixties, she wore absolutely no clothes, her face a typically Bengali face, glowing, ageless eyes, smiling. She sat on one of the rocks with a circle of street dogs around her forming a security ring. The dogs snarled when they saw ‘M’. Mai Ma scolded the dogs using peculiar sounds and they dispersed and sat at a distance. She motioned to ‘M’ to sit down. He sat down on a rock. She pointed to the dosas that he had with him and said something. He gave her the doses. She fed the dogs some, ate two herself and returned a few to him. He closed his eyes and tried to tune in with her vibrations. After a long time he opened his eyes. She was still there. Giving a broad smile she said, “Jao, jao, ills...” The last word could not be made out. . When Paramahamsas say “Go”, one has no business to stay. ‘M’ prostrated and came away. After visiting the Vivekananda Rock, ‘M’ returned to Trivandrum. . He was made aware of the significance of Mai Ma’s darshan the olIowing morning. Tired after meditating for a long time in the night, he could not bring himself to be up at dawn. As he slept deeply he had a wonderful and vivid dream. In the dream he was a mendicant with matted hair and wearing only a ‘keeping; sitting in padmasana and meditating under a Banyan tree which stood in the middle of a junction where four paths crossed each other. The jungle all around was thick. .
A faint sound made him open his eyes, and from one of the paths he saw Mai approaching with a stick in her hand. She was huge, much larger than life-size. Reaching the place where he sat she touched his chin and said, “Give me something to eat:’ . He told her, “Mai Ma, I have only two grains of parched rice hidden in my matted hair.” She said, “Give me:’ . Without hesitation he gave the rice to her. She said to him, ‘Are you hungry?” He said “Yes, but you eat it Ma:’ She ate with great relish and turning to him said, “Your hunger is for a different thing. Close your eyes:’ . He closed his eyes. She pressed the middle of his forehead hard with what seemed to be her thumb. An ocean of bliss filled his whole being with its centre in the forehead. Every cell of his being was suffused with it. He lost his body consciousness. Only the other existed. .
Then he woke up. The dream vanished, but 0! How fortunate! ‘The bliss remained. He was like a drunken man who had had his fill. Slowly he sat up and stretched his legs and carefully went to the bathroom, afraid that he would fall. In a few minutes he got full control over his body and mind but the stream of bliss continued in the core of his being. It has since remained with him. At times low, at times high, but always there. Already acquainted with the teachings of the Sufis by attending meetings of local Sufi groups and meeting some of the Amirs of the different Tariqats, he went at last to a gem among Sufis. .
That was Kaladi Mastan who lived naked on the beach near Bimapalli in Trivandrum. He was drinking a cup of tea given by a follower when ‘M’ first saw him. He smiled and gave ‘M’ the rest of the tea. Then he said, “Big thief came to steal the treasure. Take it legitimately:’ Then he lit a cigarette and said, “Smoke’‘M’ smoked. Then he took it back. ‘M’ sat and meditated before him. He covered M’s head with sand and further cleared the conduits. He behaved like a mad man and many even thought he was mad, but he was a priceless gem and the few who were serious, knew. He is physically no more now. Many visit his tomb. .
Not very far from there lived Poontharasami, another God- intoxicated person with matted hair, who too was mistaken by many to be a madman. When ‘M’ visited him, he suddenly stood up and kicked ‘M’ on his chest. That was a timely kick. It cleared the passage through which the mighty energy travels. . When ‘M’ went to thank him a month later, he had vanished, nobody knew where. An impressive looking fraud, who claimed to have been his closest disciple, tried to influence ‘M.’ The poor chap did not realize that ‘M’ could read him like an open book. When he was nineteen, ‘M’ made up his mind to go to the Himalayas. First he went to Madras by train, spent sometime in the Theosophical Society, and then took a train to Delhi. From Delhi he went to Hardwar. From Hardwar he decided to walk. All the money was finished. He had no intention of writing back home for help or even to let them know where he was. He knew he would be looked after, that the minimum needs of the body would be taken care of by the great powers that run the universe, and he was right, Of course, at certain times, he was tested thoroughly but in the end everything was fine. On foot He covered the entire journey from Rishikesh to Uttarkashi, to Gangotri, Yamunotri, from Batwari to Kedar via Buda Kedar, then to Badrinath. At Rishikesh, he decided to stay in the Divine Life Society nI continue his studies and meditation. It is a lovely place for iguanas. The Ganges flows nearby. Yoga is taught in the Ashram. The senior swamis are a great help and when one has time, one can wander around and meet sadhus of various sects. Satsang is most important for a sadhak. That pilgrim-season found ‘M’ walking again to Badrinath — sometimes on the common pilgrim routes, sometimes through frests, staying in roadside dharmashalas and chattis and many a time in forest hermitages beside the river. On his way to Badrinath, he visited Vasishta Guha and Arundhati Cave. He gathered much food for the soul. Reaching Badrinath after many days’ journey, he first slept in the choultry. It was quite cold and his single blanket was insufficfent, but he was in no mood to seek help. Those were the days when the fire of spirituality burned so bright that everything else, even the bare necessities — food, clothes and shelter — melted into insignificance. A highly intoxicating, ecstatic mood came over him in the great Himalayas. He attributed this, as also his intense sadhana to the presence of highly evolved beings in these regions. He hoped to meet some of them. His physical difficulties were solved by the arrival of a Brahmachan whom he had met earlier in the Divine Life Society. He was an experienced pilgrim who had travelled many times. Quickly he found ‘M’ an independent kutir and persuaded him to stay there. He also got ‘M’ a couple of blankets and a wooden plank to sleep on; he also arranged with the Nepali Dharmashala for his food. He introduced ‘M’ to the Rawalji, the chief priest of Badrinath, and took him on a sort of conducted tour on most evenings. In Badrinath as in other pilgrim centres, there were beggars wearing saffron, others wearing the holy robes to make a living, even sadhus who stole kamandalus and blankets from each other. Genuine yogis and paramahamsas also existed side by side, mingling with the common crowd and often deliberately pretending to be one of them. Eager to see more of such souls and learning that they lived beyond Badrinath and on the other side of Narayan Parvat, ‘M’ decided to travel further. Without informing anyone, one morning he started off with his kamandalu, staff and blanket. He had earlier explored about a kilometer of that road on his previous visit to Badrinath but beyond that the territory was unknown. After about six or seven kilometres of not easy climbing, he reached the confluence of the Saraswati and the Alakananda, called KeshavPrayag. Close to this was the cave, which, an old sanyasin had once told him, was the Vyasa Guha. ‘M’ walked beyond the Vyasa Guha to explore the other caves in the vicinity He had walked through the rocky terrain for a long time when he realized that it would soon grow dark. Filled with doubt, fear and hunger, and disappointed about not finding any mahatmas, ‘M’ began to walk down towards the Mana village. On the way back, when he reached the Vyasa Guha, he found that a dhuni was brightly burning at the mouth of the cave. A strange force seemed to make his feet heavy His heart overflowed with bliss but his legs would not move away from the cave. He took this as a signal and walked towards the cave. From inside the cave came a voice calling him by the name “Madhu’ Seeing this young man, the long-haired, bare-bodied, tall man patted on his left shoulder with great affection and asked him to sit. At that instant, ‘M’ recognised the person whom he had once met in the backyard of his house under the jackfruit tree. He had found his guru, his father, his mother, all in one. According to the Master’s advice, ‘M’ went back to the plains, met many spiritual teachers and godmen, travelled all over India, took up difficult jobs to earn a living and to “see the world at close quarters,” as the Master put it. He also lived for a short while like a very materialistic-minded person, and found that compared to the spiritual life and its greater vistas, the life of the worldly man is almost nothing. I he joys of the spirit am much superior and it is the worldly man who renounces real happiness that springs from the heart. Now ‘M’ feels that he can say with confidence, “Friend, I know, and there is nothing to go gad about:’ Off and on he had attended the talk’s of.J. Krishnamurti in Madras and elsewhere and read most of his literature. Finally he met him and had a private discussion for forty-minutes after which he decided to stay on in the Krishnamurti Foundation for sometime. The Master had said that Krishnamurti would be the last of the important persons that ‘M’ would meet as part of his education and had instructed him to pay particular attention to everything that ‘K’ did and how the organization would function when he lived and after his death. ‘M’ had close i.ontact with. Krishnamurti during the last two years of his life and was made a Trustee of the Krishnamurti Foundation, which position he resigned after five years. After Ski’s death ‘M’ married Sunanda whom he had met in Vasant Vihar, the headquarters of the Krishnamurti Foundation, and became a householder. The psychic channels in the spine and brain were opened up and the dormant energies activated so that the contact between the mind and the higher Consciousness was reestablished. He now feels that no one can say to him, “Well, brother, it is alright for you to say, ‘lead a spiritual life and live in the world etc, because you are unmarried ...“and so on. ‘M’ lives with his wife and two children. “In fact, it is the best thing to do in thi5 period of the earth’s existence, for Sanyasa is only for the rarest of the rare,” says ‘M With the blessings of his Himalayan Master and by strenuous sadhana ‘M’ has transcended theories and scholarship and is established in higher consciousness. The Master had said to ‘M,’ “Do not advise people if you cannot follow the same advice. Do not talk on something if you have no personal experience” Wonderful teaching indeed! If only teachers follow this teaching what a lovely world this would be!